Shawn Cambron, foreground, and Ronald Cambron, background, sit in Highland County Common Pleas Court during sentencing hearings on Wednesday. Two brothers who robbed a Hillsboro gas station together last summer are now headed for prison together. 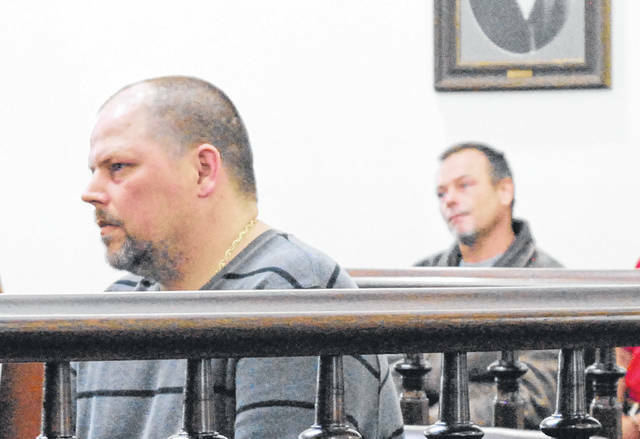 Ronald William Cambron, 41, Batavia, whose criminal record includes at least 21 felonies, was sentenced to 18 months in prison Wednesday in Highland County Common Pleas Court, and Shawn Lee Cambron, 39, Cincinnati, was sentenced to 14 months in prison. According to an affidavit filed in the case, the brothers robbed the Sunoco gas station on East Main Street in Hillsboro on Aug. 24 last year, and were caught in the act by the Hillsboro Police Department after triggering alarms. When officers arrived, the two were seen in the store with their faces obscured, and when they were ordered to stop and show their hands, they bolted out the back door, according to the affidavit. They were apprehended soon after. The Cambron brothers pled guilty in December to breaking and entering and possessing criminal tools, according to online court records. During Ronald Cambron’s hearing, the defendant apologized for his actions and asked Judge Rocky Coss for lenience. “No one’s more ashamed of my actions than I am,” he said. While reviewing a presentence investigation report during the hearing, Coss said despite Ronald Cambron being charged with 21 felonies in Ohio and Kentucky, he did not see evidence that Cambron had been adequately punished for his crimes. Ronald Cambron was sentenced to nine months on each count to which he pled for a total of 18 months. The younger Cambron also said he was high on Xanax at the time and did not remember what happened. His attorney, Bill Armintrout, said Shawn Cambron had two prior convictions and was enrolled in drug treatment. Coss sentenced Shawn Cambron to seven months on each count for a total of 14 months. Travis Jay Applegate, 37, Lynchburg, one year, forgery, guilty plea. According to court documents, Applegate took a checkbook from his girlfriend’s kitchen cabinet and wrote a $23,630 check for a 2007 Dodge Ram truck. The girlfriend told authorities she did not give him permission to write the check, court documents said. Matthew Potts, no birth date on file, Hillsboro, seven months concurrent to a Ross County prison sentence, improper handling of firearms in a motor vehicle, guilty plea. According to court documents, Potts was pulled over in December 2017 and had a loaded sawed-off shotgun beneath the driver’s seat. Keith Mick, 30, Piketon, possession of heroin, guilty plea. Kathleen Kelly, 54, Lynchburg, aggravated possession of methamphetamine in two separate cases, and aggravated trafficking in methamphetamine, guilty plea. Tiffany McKenzie, 38, Dayton, aggravated possession of methamphetamine, guilty plea. Shannon James, 48, Hillsboro, aggravated possession of methamphetamine, guilty plea. Joseph Rankin, 30, Hillsboro, aggravated possession of methamphetamine in two separate cases, guilty plea. Michael Cooper, 34, Bainbridge, possession of marijuana, guilty plea. Alyssa Bellow, 31, possession of marijuana, guilty plea. Bellow was not ordered to complete drug treatment. Also Wednesday, Timothy Collins, 57, Cynthiana, was ordered to successfully complete treatment at the STAR Community Justice Center after pleading guilty to having weapons under disability.